The Super Angel Juicer is constructed of only the best material. It has the sleekest look of any juicer on the market. With a natural stainless steel finish, this twin gear juicer will provide you with everything you have ever wanted in a juicer. The 82 RPM Twin Gear ensures you will squeeze every last drop opf juice possible from your extraction efforts. 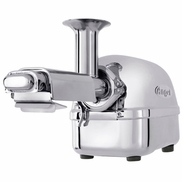 By keeping the RPM down, this Super Angel Juicer ensures that anyone who uses it gets all the enzymes they were meant to from their food. Motors that run faster (1500 RPM or more) will spit your juice out quickly, but will also lose a lot of the good nutrients inside the food. This premium Super Angel Juicer will give you anywhere from 20 to 30 percent more juice from the same foods than competing juicers. This machine is impeccable! My wife and I are truly excited with it's performance. We have used several juicers over the years but this one is superior because of it's far less and drier pulp/husk. The juice itself feels more "lively" coming from this product. We are deeply satisfied. Thanks! What's The Real Value OF Healthy Living? The machine is fantastic. Easy to use, maximum efficiency, easy to clean. We are impressed with our new juicer and use it every day. It makes juicing fun. We quit juicing years ago because of the mess and clean up. This machine takes care of those issues for us. Love it! This is a pro/commercial/home juicer used in juice bars. Heavy duty. Great for serious juicing. Easy to assemble and use.